Olusegun Obasanjo is a former Nigerian Army general who has twice served as Nigeria’s head of state as a military ruler from February 1976 to October 1979 and as a democratically elected President from May 1999 to May 2007. Olusegun Mathew Okikiola Aremu Obasanjo was born circa 5th of March 1938, in Ogun State and grew up in Owu, Abeokuta. His first name, Olusegun, means “The Lord is victorious”. Olusegun attended Baptist Boy’s High School, Abeokuta from 1952 – 1956. He did quite well academically but was unable to go to university due to his family’s low financial circumstances. At the age of 21, he enlisted in the Nigerian Army. He attended the 6-month Short Service Commission training at Mons Officer Cadet School in Aldershot, England. He further trained at the Royal College of Military Engineering in Chatham and School of Survey in Newbury, Royal Defense Studies, London in England, Indian Defence College, Indian Army School of Engineering, Poona and the Defence Services Staff College, Wellington. He was thereafter commissioned as an officer in the Nigerian Army. As a soldier, President Olusegun Obasanjo served at 1 Area Command in Kaduna. After being promoted to Chief Army Engineer, he was made commander of 2 Area Command from July 1967, which was redesignated 2 Division Rear, and then the Ibadan Garrison Organisation. He has also served with the United Nations Peacekeeping Force in the then Congo. During the Nigerian Civil War, he commanded the Army’s 3rd Marine Commando Division that took Owerri, effectively bringing an end to the civil war. In 1974, Brigadier Olusegun Obasanjo was appointed Federal Commissioner for Works and Housing. After the coup of July 29, 1975, he became the second-in-command to Brigadier Murtala Muhammed as the Chief of Staff, Supreme Headquarters. On 13 February 1976, coup plotters, led by Army Col. Dimka, marked him, Murtala and other senior military personnel for assassination. Murtala was killed during the attempted coup, but Obasanjo escaped death. He was later appointed as head of state by the Supreme Military Council. Keeping the chain of command established by Murtala, Obasanjo pledged to continue the programme for the restoration of civilian government in 1979 and to carry forward the reform programme to improve the quality of public service. On 1st October 1979, Obasanjo handed power to Shehu Shagari, a democratically elected civilian president, hence becoming the first military head of state to transfer power peacefully to a civilian regime in Nigeria. In 1995, Obasanjo was imprisoned on fabricated charges of plotting a coup to depose General Sani Abacha. He was released only after Abacha’s sudden death on 8 June 1998. While in prison, Obasanjo became a born-again Christian. In 1999, Olusegun Obasanjo became President of the Federal Republic of Nigeria. The 29th of May, 1999, the day Obasanjo took the oath of office as the first elected civilian head of state in Nigeria after 16 years of military rule, is now commemorated as Democracy Day. A public holiday in Nigeria. The Olusegun Obasanjo administration initiated and executed projects that positively impacted the lives of Nigerians irrespective of their status. They included the Poverty Eradication Program, the establishment of the Niger Delta Development Commission to facilitate the provision of more infrastructure and social services in the oil producing communities of the Niger Delta, Universal Basic Education and the general improvement of infrastructure. These were aimed at changing the economic, educational and political development of deprived Nigerians. Obasanjo was re-elected in 2003 in a landslide victory defeating General Buhari and Chukwuemeka Odimegwu Ojukwu. In 2008, Obasanjo was appointed by the United Nations as a special envoy for Africa and has since overseen democratic elections on behalf of the African Union and Ecowas in countries across the continent. Obasanjo is a member of the Africa Progress Panel (APP), an independent authority on Africa launched in April 2007 to focus world leaders’ attention on delivering their commitments to the continent. The Panel launched a major report in London on Monday, June 16, 2008, entitled Africa’s Development: Promises and Prospects. He is also a member of Club de Madrid, an independent non-profit organization created to promote democracy and change in the international community. Its members are over 100 former democratically elected Presidents and Prime Ministers from more than 60 countries. Obasanjo was married three times. First to Mrs. Oluremi Obasanjo, who is the mother of his oldest children, the most well-known of them being Dr. Iyabo Obasanjo-Bello, a former Senator of Ogun State. His second marriage was to Lynda Obasanjo, who was fatally shot when armed men ordered her out of her car in 1987. His third marriage was to Stella Obasanjo, who served as the First Lady of Nigeria. She died after a cosmetic surgery procedure in Spain in 2005. 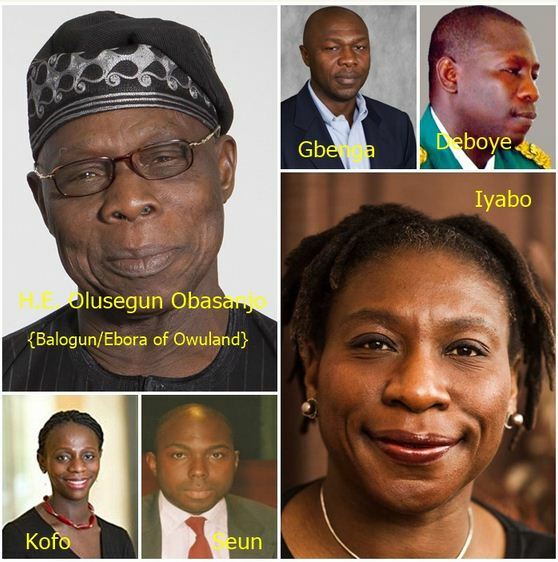 Obasanjo’s other prominent children include Dare Obasanjo, a Principal Program Manager for Microsoft and Adeboye Obasanjo, a Lieutenant Colonel at the 3rd Division in Jos, Plateau State. Obasanjo was accused of being responsible for political repression. In one particular instance, the compound of Nigerian musician and political activist Fela Kuti was raided and burned to the ground after a member of his commune was involved in an altercation with military personnel. Fela and his family were beaten and raped and his mother, political activist Funmilayo Ransome Kuti, was killed by being thrown from a window. Her coffin was carried to Obasanjo’s barracks as a protest against political repression. Obasanjo was also embroiled in controversy regarding his Third Term Agenda, a plan to modify the constitution so he could serve a third, four-year term as President. This led to political media uproar in Nigeria. The bill was not ratified by the National Assembly and consequently, President Olusegun Obasanjo stepped down after the April 2007 general election. Like most politicians and people who have held positions in the Nigeria Government, Obasanjo has been able to accumulate wealth. Though he refers to himself as just a farmer, we believe his running as a two time Nigerian head of state did well to boost his wealth. Apart from his assets amassed from being a politician, he happens to be a farmer and a shrewd businessman who has one of the largest chicken poultries in West Africa, owns an oil block and is covertly involved in over 6.5% of the total major oil production, marketing, and distribution in the country. With all this, his net worth is estimated to be around a whopping $1.5billion. OBJ as he is fondly called also has many landed properties and one of his most prominent ones is his Hilltop home. This house is a beauty and it is located on a Hilltop in Abeokuta about an hour drive from downtown Lagos. The house which reportedly has fifty rooms and a cinema (popularly known as The Olusegun Obasanjo cinema), was built by the Abuja based Italian Company called Messrs Gitto Construzioni Generali Nigeria Limited. It was completed around the time before OBJ left office as president in 2007.